A skydiving employee who’s never jumped before. An orange that rolls uphill. 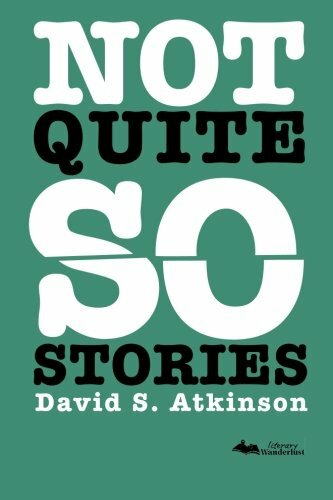 These are the quirky circumstances of David S. Atkinson’s latest collection, Not Quite So Stories, full of magical realist conceit that can by turns be satirical or horrific. Atkinson has a knack for the former, situational humor, such as in “Changes for the Chateau.” A satirical farce that pokes fun at customer service in France, it aims for those who know what it’s like to be an American in a place that doesn’t understand they’re working for you, not the other way around. And Atkinson is at his funniest in “Home Improvement,” in which a homeowner finds their house up and gone like a deadbeat dad. It’s hilarious, only the writing doesn’t pop off the page–it sneaks up on you and suddenly you realize what you’re reading isn’t reality. The line, “‘Police don’t like to handle domestic situations,’” a reaction to the missing house, is almost golden. The house/tenant relationship is treated as a love affair and the house has its own agency, even putting an ad in the personals looking for a better owner. It’s personification at its best. In the latter category are stories like “The Bricklayer’s Ambiguous Morality.” With its realistic male machismo dialogue of adolescents, it stands out as perhaps the most compelling of the stories in the collection. A boy enlists into the armed forces despite somehow shooting his best friend with a brick he was supposed to carry with him to teach him responsibility. It’s weird, yet heartbreaking, and doesn’t ever come across as anti-military propaganda. Some are not quite as effective, such as “Domestic Ties,” in which a housewife’s OCD-like daily ritual is disrupted when the “state” requires her to take a prisoner into her own home. What initially feels like an interesting, positive portrayal of what it’s like to be a prisoner becomes a violent cliché that leaves very little to be learned other than that those indoctrinated into jail cells can’t survive in a normal household, nor be civil to those outside bars. Overall, though, the collection is solid and is one that fans of Hitchhiker’s Guide to the Galaxy might enjoy. In particular, “A Brief Account of the Great Toilet Paper War 2012” brings to mind the writing of Douglas Adams. It reads like legal paper and brings an Asperger’s-like quality to the conflict between man and wife on replacing the toilet paper roll. But take heed; although the title of the collection suggests brevity, Atkinson’s stories, albeit well constructed and almost mechanical in their consistency, aren’t sparse in words, and it’s almost impossible to read more than one or two in a sitting. But maybe that’s not so bad–we don’t all have to be Hemingway, and some collections are meant to be digested slowly.